Performers include: Don Messick, Casey Kasem, Nicole Jaffe, Frank Welker, Stefanianna Christopherson, Heather North, John Stephenson, Hal Smith, Jean Vander Pyl, Vic Perrin, Barry Richards, George A. Robertson, Susan Steward, and Michael Stull. A group of teenage friends and a Great Dane travel from town to town in their Mystery Inc. van. The gang stumble upon mysteries and investigate reports of ghosts, monsters, and other strange events. 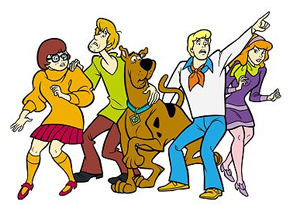 The group of amateur detectives are Freddy Jones (Frank Welker), the group’s handsome and inventive leader; Daphne Blake (Stefanianna Christopherson, later Heather North), Fred’s intuitive and wealthy girlfriend; Velma Dinkley (Nicole Jaffe), the group’s brainy member; and Shaggy Rogers (Casey Kasem), their ever-hungry and ever-terrified friend. Scooby-Doo (Don Messick) is Shaggy’s dog and shares his owner’s appetite for food and fear of anything scary. Shaggy and Scooby would much rather avoid all mysteries but can easily be talked into taking part with the promise of a tasty Scooby snack. The gang inevitably uncovers that the strange phenomenon they’ve been investigating is simply a hoax. They’re typically perpetrated by adults who want to disguise a crime by making it look like a supernatural event. They’d have gotten away with the trickery if not for the team of meddling kids and their dog. More about: Scooby-Doo Where Are You!